When we increase blood to the brain, we increase the oxygen flow carried by the blood. Hyderegene treatment is one such way of improving and regulating the level of blood and oxygen in our brains. A regular Hydergine dosage has a number of positive effects on brain cell health, our ability to minimize harmful free radicals and can improve mental ability. Hydergine treatment is one such course of supplements that are classed as ‘smart drugs’ or belonging to the category known asNootropics - drugs that are neuroprotective, non-toxic, improve mental ability and posses few side effects. A Hydergine dosage does this by facilitating a simple formula – when we increase blood to the brain, we increase oxygen to the brain. Derived from Rye, Hydergine is also known as codergocrine mesylate, codergocrine and hydergina novartis. It’s proven to be one of the world’s most useful smart drugs, sitting alongside brain-boosters nicergoline, piracetam and xanthinol nicotinate. These are linked in the way that they work as all of them are known to increase oxygen to the brain and therefore elevate cognitive power. This oxygen increase is known to affect brain cells on a micro-cellular level – rejuvenating the cells themselves and slowing down mental decline. By helping the brain cells work more efficiently, it’s known to actively increase intelligence. Of course vital to our being, oxygen in our brain needs to be balanced. Too much or too little can upset the balance and generate free radicals, which can lead to cell deterioration and aging. In a process called peroxidation, oxygen reacts to the unsaturated fats and generates these harmful free radicals. As our brain cells contain more unsaturated fats than any other part of the body, it is here that we are most at risk. Free radicals are linked strongly with the aging of cells and of course the subsequent decreased efficiency of our body and minds and in effect, mental decline. 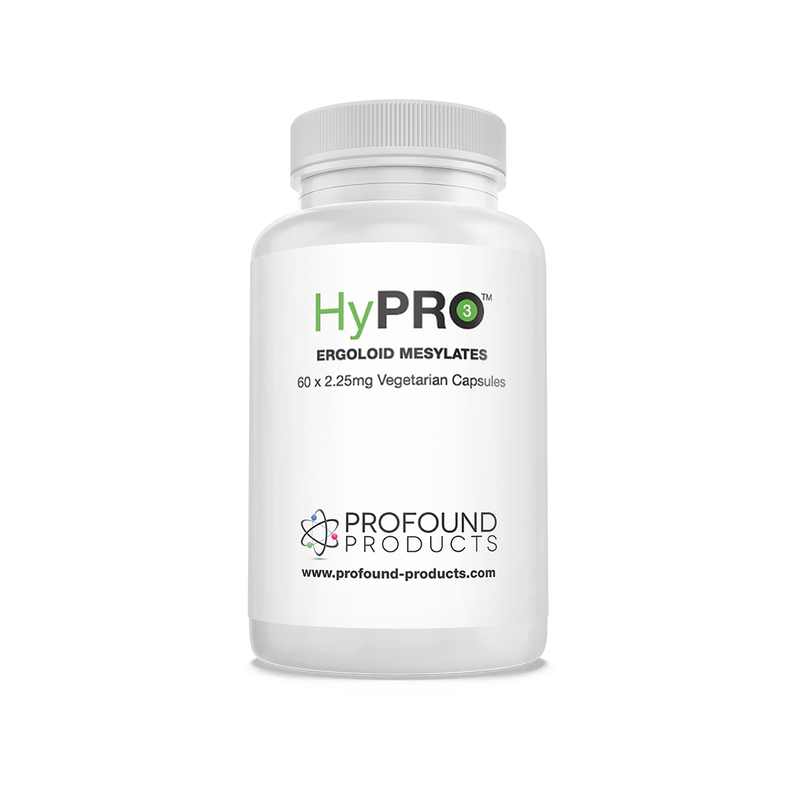 Hydergine addresses this peroxidation and by possessing these duel functions – the right blood and oxygen balance – Hydergine can improve mental ability, and slow down the damage caused by peroxidation. Hydergine is used in many countries for emergencies and accidents that involve heart attacks or strokes. It is administered in these cases before an operation or procedure as it has the quality of stabilizing the levels of oxygen in the brain – minimizing the chance of damage if this balance is upset. This demonstrates the far reaching and critical role a stable oxygen level in our brains is to our health. There is evidence that Hydergine stimulates the growth of dendrite nerve fibers. These naturally decline with age and some scientists have associated the quantity and density of dendrites with intelligence. By studying the cellular effect of a regular and long-term Hydergine dosage, scientists discovered that the size of mitochondria – the cells that contain enzymes for respiration and energy production - increased progressively. Thus the test concluded that Hydergine rejuvenated these mitochondria to the levels more common in younger brains. This shows us that a Hydergine dosage has the capacity to increase intelligence and means that it has valuable uses and applications in an antiaging programme. The smart drug Hydergine has few side effects - especially when the quantity is increased slowly and incrementally. It even has the ability to normalize systolic blood pressure, but if you suffer from high blood pressure it’s always best to talk to your doctor before taking any course of medicine. Even in quite high dosages, Hydergine’s side effects equate to mild headaches and feelings of nausea - something that a slowly increased 1.5mg increment of Hydergine will not provoke. A daily Hydergine dosage varies between 2.25mg to 9mg, meaning that different dosages are recommended for different conditions. We offer Hydergine 4.5mg tablets which are scored so that half a tablet or 2.25mg can be taken as required. Hydergine’s minimal side effects, coupled with the brain-boosting power of getting more oxygen to the brain make it a simple and effective way to improve our mental ability and beat mental decline.